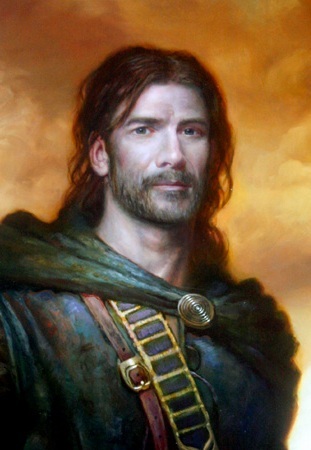 Lóegaire Óengus, a medieval supervillain in the making! Ever since reading an article on them in White Dwarf back in the 80s I’ve wanted to run a long-term nemesis that starts at low level and essentially develops in power as the heroes do. The party came across Lóegaire Óengus very early on in our Legend campaign as a charming but malicious malcontent who was trying to turn a village against its ageing priest. He very nearly succeeded, but was foiled whilst trying to use the innocuous Father Thomas as a human sacrifice to desecrate the church. That time he escaped; he’s a Dragon Warriors ‘Darkness Elementalist’, or at least he was to begin with, and has a number of useful evasive tricks up his sleeves. Actually, that’s the only time they met him, but they’ve been dogging each others’ footsteps ever since. Unfortunately, he seems to have a penchant for committing his thoughts and plans to paper in the form of journals, which he leaves lying in various places, so they are aware of some of his activities and know that they have become the target of at least some of his actions. They have discovered, for example, that he had learned the whereabouts of a long forgotten book on demon lore, the Demonicon. He has now made a career change and has swapped paths from common or garden Darkness Elementalist to full-blown Demonist á la “In From The Cold” (albeit in Savage Worlds form). Shortly after stealing the book, however, Lóegaire was captured by the Whitecloaks, a group of religious knights on a crusade against all uses of magic. Although their leader was severely injured by a summoned demon in the ensuing skirmish, Lóegaire managed to persuade the gullible adjutant that he was an innocent. It was then that the heroes nearly encountered him again as they happened on the scene of the battle just hours later. With Lóegaire being held captive outside the main camp they arrived at the field hospital to help with the wounded but remained ignorant of his proximity. Following their departure, Lóegaire seized the opportunity to embed himself in the quasi-religious order by convincing the adjutant that he was a man of the cloth on the basis of his command of the Bacchile language (read Latin), becoming the platoon’s chaplain. This also left him free to come and go pretty much as he pleased. He always had a silver tongue and he has used his freedom to practice some of the dark arts from the book, including summoning a major plague demon, which he promptly sent to the village where he was first crossed to wreak his twisted revenge. Not satisfied with this, he signed an affidavit swearing that one of the heroes was responsible for this nefarious deed. As the group were already under suspicion from the Whitecloaks for associating with witches and warlocks, they didn’t need any further proof before publicly denouncing them in front of a local baron. The baron is the party’s patron and although he knew them to be innocent of this foul crime, the people also needed to know this, and so he arranged a trial by combat. The Whitecloaks enjoy quite a following among the common folk, and it would not have done to simply dismiss the case out of hand. Nobody would dare question God’s own judgement though. Sir Elathan defeated the Whitecloaks’ champion in a fair fight and cleared their name. Now that the heroes have taken care of other obligations, stopping Lóegaire has become their number one priority. First, however, they will need to obtain some necessary tools to match the diabolical power of the Demonicon. This entry was posted in dragon warriors, Uncategorized. Bookmark the permalink. I don’t even know how I stopped up here, however I thought this post used to be great. I don’t recognize who you are however certainly you’re going to a famous blogger if you happen to aren’t already.